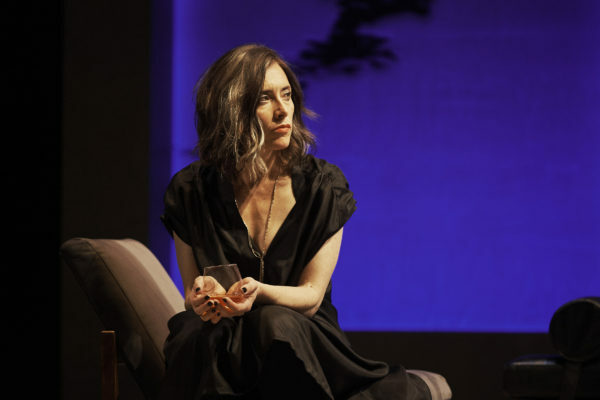 An ambitious reimagining: Chris McCormack reviews a new play inspired by Ibsen’s A Doll’s House. Nora at Project Arts Centre, Dublin. Photo: Ros Kavanagh. “It’s supposed to wake you up,” preaches Nora, early in the Corn Exchange’s reimagining of A Doll’s House. Though she’s referring to a modern painting in her apartment, she also confirms this production’s awareness of its inheritance: a play that once shook the world. Written by Belinda McKeon, in collaboration with Annie Ryan, this daring update to Henrik Ibsen’s 1879 drama exchanges the banking world for the realm of art dealership. In the year 2025, we find Nora and her husband Turlough living luxuriously as gallerists. Within minutes, the astute script charts the liberalised attitudes to women since the era of Ibsen’s original. Annie Ryan’s self-possessed Nora is nonchalant upon hearing her friends have separated: “You can’t blame her for wanting to leave him”. Is Ibsen’s work done? This ambitious reimagining suggests not, as Nora’s friend Krista (the adept Clare Perkins), a subversive artist, arrives disturbed. Seeking asylum after her home was overcome by alt-right violence, she’s desperate for Turlough to grant her patronage. Nora, literally living underground, is mostly gobsmacked that Krista’s gallerist – a man – didn’t protect her. She isn’t exactly woke. A stirring moment in director Eoghan Carrick’s well-paced production comes when Nora’s jaunty daughter Emmy (the sharp Venetia Bowe) is made vulnerable, put on display to be objectified like a piece of art. Despite the modern female character of this world, a misogynist element is illuminated through shifting appearances and perceptions. Nora’s former colleague Kroger (Peter Gaynor), a disgraced bohemian dealer, later arrives in need of healing his reputation. “We can’t control what people think of you,” she snaps. “Yes you can,” he replies. Clever control of optics aside, McKeon and Ryan are less attentive to the mechanics of plotting. Is Nora genuinely inspired by her anti-establishment friend? How exactly can a painting from the past damage her business? It doesn’t help that Declan Conlan’s Turlough is bombastic when lashing out at her, whilst Ryan’s performance is a study in restraint. This all brings us to the realised erasure of Nora’s work, first as a painter and now as a gallerist. When the time comes for her to leave, as she must, it’s hard to understand her reservations, or indeed why any of the play’s injustices are suddenly silenced. Unlike its inspiration, Nora lacks departure. Nora is on until 8 October 2017 at Project Arts Centre in Dublin. Click here for more details.